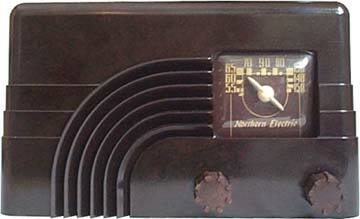 Five-tube ("AA5") with bare brown bakelite cabinet, AM band only, 10 5/8" wide by 6 1/4" high by 6" deep. This classic Art Deco design is the first version of the "Rainbow" design, although sometimes that curved design is called a waterfall. "Rainbow" is simply a nickname that collectors have given it. I've seen several variations with the Rainbow cabinet, mostly in the dial. This model 5000 has a dial with a pointer that looks somewhat like a propellor, and the graphics that look like an upside-down horseshoe. The later versions of the Rainbow have a longer pointer, pivoting slightly below the centre of the dial. The 5110 "Deluxe" Rainbow model, with a third knob in the centre, for tone control. Another three-knobbed model, the 5002 has a BC/SW band switch in the middle. 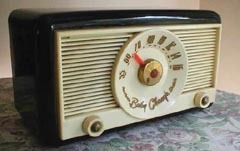 Later models of the Baby Champ, like the 5200 from 1948 looks completely different from the rainbow design. See also the 5400, 5500, and 5700. Less Art Deco, more Jet Age. February 19, 2003 - I spotted what appears to be a model 5000 with a third knob for tone control, on eBay. Same dial face and dial pointer. 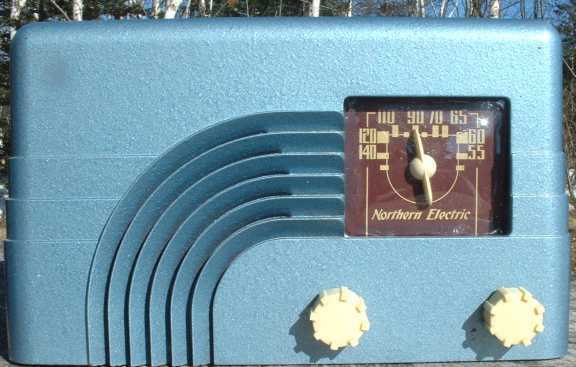 March 23, 2003 - Keith Longmire of Hillsburn, Nova Scotia, has sent me a photo of a repaired and repainted model 5000 with the reversed dial face - the lower frequency is on the right, and it goes higher as you turn it counter-clockwise. I had heard of one like this, but had not seen any until now.